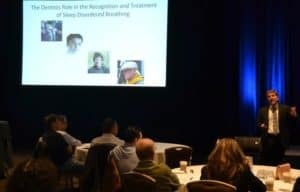 “I believe that it is the obligation of every dentist to understand the basics of Sleep Disordered Breathing (SDB), screen every patient in their practice for SDB, and become part of the patient’s care when it is appropriate,” said Dr. 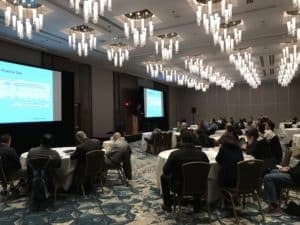 Rob Veis to the attendees of the California AGD Fall meeting in San Francisco on November 13, 2016. Multiple medical problems are associated with SDB including obesity, excessive sleepiness, depression, hypertension, cardiovascular disease, diabetes, stroke, cognitive impairment, and cerebrovascular disease. Apnea is defined as the cessation of airflow for 10 seconds or longer. It is the most common form of sleep disordered breathing. Approximately 42 million American adults have SDB. One in 5 adults has mild OSA, while 1 in 15 has moderate to severe OSA. 9% of middle-aged women and 25% of middle-aged men suffer from OSA. Its prevalence is similar to asthma (20 million) and diabetes (23.6 million of US population). However, 75% of severe SDB cases remain undiagnosed. The dentist’s role is to screen every patient, work within a team of experts, and treat with appliance therapy when it is appropriate. Dentists can screen for Sleep Disorders in their practices by incorporating screening questionnaires, inquiring about sleep history and medical history, and by performing screening examination. Screening should address the predisposing factors, signs, and symptoms of OSA. Age and obesity predisposes to OSA where prevalence progressively increases with increasing age and weight. Disproportionate upper airway anatomy, taking sedative-hypnotic drugs in late PM and hyperthyroidism are other predisposing factors are. Sleep apnea is also 5 to 10 times more common in males. Signs and symptoms of sleep apnea includes lack of energy, morning headaches, hypertension, frequent nocturnal urination, depression, obesity, large neck size, excessive daytime sleepiness, nighttime gasping, choking or coughing, gastroesophageal reflux, irregular breathing during sleep (i.e.snoring). Screening exams involves evaluating the general appearance of patients such as height and weight, neck size, shirt size, Angle’s classification. Orally, hard palate, soft palate and uvula, tongue and tonsils are examined. Successful treatment of snoring and sleep apnea is dependent on accurate diagnosis of the region(s) of obstruction, and treatment directed to the etiology. Sites of anatomic obstruction can be nasal (turbinate hypertrophy, septal deviation, and polyps), elongated soft palate & uvula, tonsillar hypertrophy, macroglossia (scalloped borders), retrognathic chin/maxilla/mandible, inferiorly positioned hyoid bone, and laryngeal obstruction (polyps, vocal cord paralysis). Oral Appliances for the management of snoring and OSA are of interest to dentists. Out of 150 + different appliances, most dentists select 3 to 4 that they will use regularly. The effective clinician understands the functional characteristics and design variations of many appliances. Appliance therapy should involve the appropriate appliance selection, taking accurate impressions and construction bites, delivery and adjustments, and follow-up in-office evaluations and medical evaluations. A morning repositioner can be designed to help return the patient’s mandible back to its pre-treatment centric position. A copy of the physicians written prescription for an appliance along with the patients sleep study and any other supporting information are necessary for the authorization and the billing process. Are you able to sleep with the appliance? Are your teeth sore in the morning? For how long? Is your bite different than normal in the morning? Does your jaw hurt? When? For how long? Did your bed partner hear you snore? If so was it as loud as usual? Was any gasping or snoring observed? Did you appear to stop breathing at any time? Was your breathing any different than prior to appliance placement? Did you wake up often? Do you feel more refreshed in the morning? How about the rest of the day? 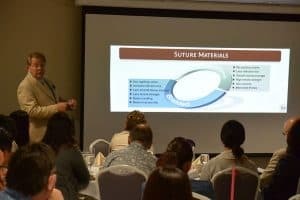 What distinguishes California AGD CE Courses? 2. Well-equipped and comfortable conference rooms in central locations. 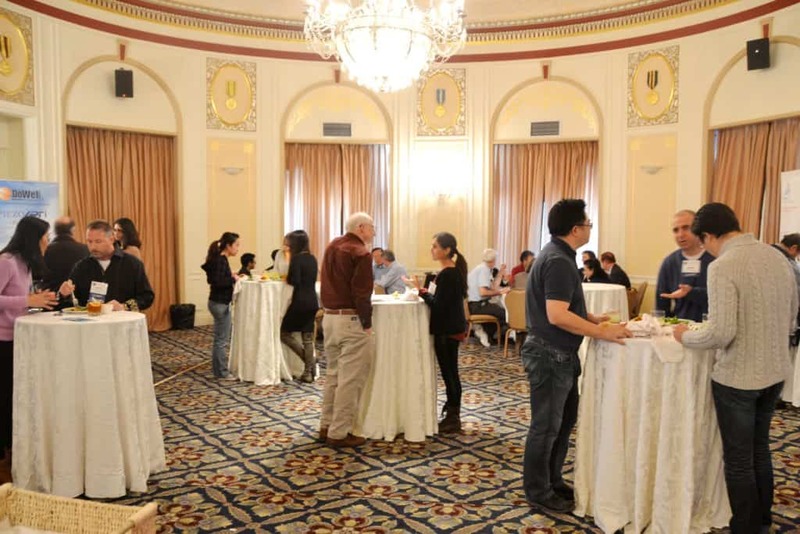 The 2016 CAGD Fall meeting was held at Hotel Nikko in San Francisco. 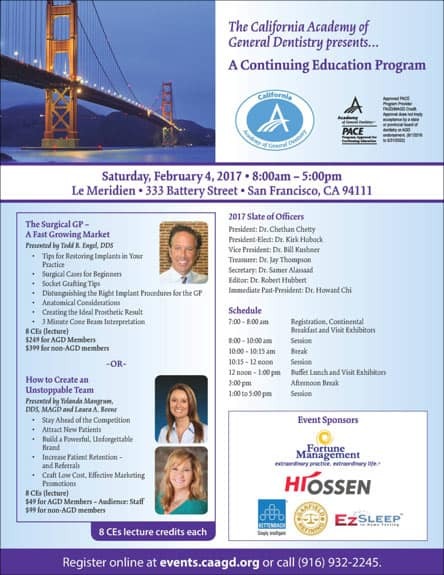 The upcoming 2017 CAGD Annual meeting will be held at the Le Meridien Hotel in San Francisco. 3. The personal interaction and attention you receive from company representatives. 4. 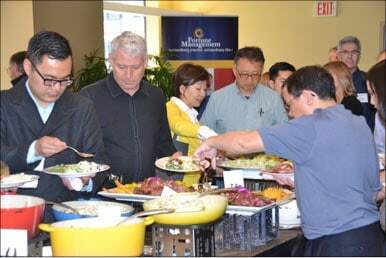 The fellowship during the breakfast and lunch included in the course registration. In 2005, Dr. Todd B. Engel’s lifelong dream of creating a learning institution where he could share, teach and motivate other dental professionals was realized by the inception of the Engel Institute. The Institute has grown now to include four locations with faculty both nationally and internationally and has trained well over 2000 dental professionals in its short tenure. Dr. Engel has extensive experience in Dental Implant Rehabilitation, CT Guided Surgical Design, Complex Treatment Planning as well as Full Mouth Rehabilitation. 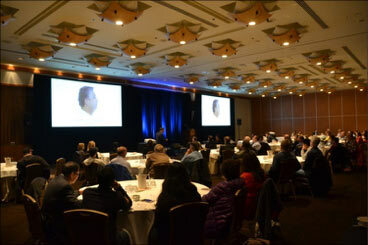 Dr. Engel has hosted live radio, authored several articles and has been a featured keynote speaker, both nationally and internationally on topics such as Dental Implants and Restorative Applications, Digital Radiography, CBCT – Cone Beam Technology, Ridge Augmentation and Socket Preservation, Treatment of the Edentulous Patient, Current Dental Materials as well as Comprehensive Treatment Planning on Medically Compromised Patients. Dr. Engel is a Diplomat of the International Congress of Oral Implantologists and maintains active membership status with the following associations: American College of Oral Implantology, Academy of Osseointegration, and American Academy of Implant Dentistry, Academy of General Dentistry, American Dental Association, North Carolina Dental Society, California Dental Association, and the Orange County Dental Society. Dr. Engel is originally from Van Nuys, California and has resided in Orange County, California since 1997. He is a graduate of the University of the Pacific School of Dentistry where he also received his Doctorate of Dental Surgery. Co-author of the new book, “Hire to Inspire,” Dr. Mangrum began her dental career in 1989 when she received on-the-job training as a dental assistant and later became a licensed Registered Dental Assistant. While working as a dental assistant, she completed her Bachelor of Science Degree in Biology at UC Riverside and completed the Dental Laboratory Technician certificate at Riverside City College. Dr. Mangrum entered the UC San Francisco School of Dentistry in 1993. Her previous dental experience afforded her the time to be active in student government. She served in numerous positions and committees including Class and Associated Student UCSF president. Her active student leadership, as well as her student teaching, caught the attention of the administration, which lead to a faculty position offer as Assistant Clinical Professor just three months after graduation in 1997. Teaching is a passion for Dr. Mangrum. She currently holds faculty positions at both UCSF and UOP Dental Schools. 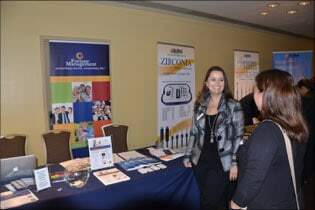 Continuing her involvement in organized dentistry after dental school, she has served as President of the Northern California Academy of General Dentistry and Secretary of the California Academy of General Dentistry. 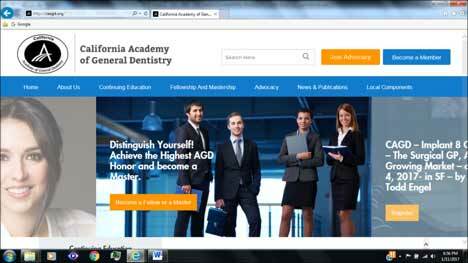 One of the Academy of General Dentistry’s missions is to promote continuing dental education. 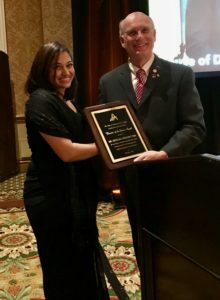 The academy recognized Dr. Mangrum for meeting the requirements as a Fellow in the Academy of General Dentistry (FAGD) and later she received her Mastership in AGD, a very prestigious honor that has been earned by only 88 other dentists in California. In 1999, Dr. Mangrum opened her dental practice in Sonoma from scratch. In 2009, she purchased Petaluma Dental Group. Her personal experience in all dental office positions gives Dr. Mangrum the insight to lead her team; she understands the challenges in each position and is well-suited to helping them find solutions to those challenges. In 2011, Dr. Yolanda Mangrum was awarded California’s Dentist of the Year by the Academy of General Dentistry for her outstanding achievement in her field. A quote that often is used in reference to Dr. Mangrum’s ethics and achievements comes from John Fitzgerald Kennedy as he states, “As we express our gratitude, we must never forget that the highest appreciation is not to utter words, but to live by them.” Dr. Mangrum is an ambitious leader and understands that there is potential for greatness to be unlocked in every individual. It is her opinion that the possibilities for growth are limitless, and her ambition is contagious. 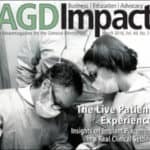 The statements expressed in this newsletter do not necessarily reflect the opinions of the California Academy of General Dentistry (CAGD), nor do they imply endorsement by the CAGD.